For Walt Koren, it would be easier to know that his old friend is dead. Instead, he's lived with uncertainty for 41 years. Whether William Patrick Millner, an Army Air Cavalry pilot in Vietnam and high school classmate of Mr. Koren's, survived a crash landing in Laos in 1971, and whether he remains in captivity somewhere in Southeast Asia, are questions that haunt him to this day. "I thought he'd been killed. Later, I learned he was missing in action, and it was easier to accept that he'd been killed," said Mr. Koren, a 63-year-old construction manager now living in Myrtle Beach, S.C.
"I still sit there constantly and think about him every Sunday at church. I think about him still being a prisoner of war, and hear rumors he's being held in Laos. I hope that's not the case. How would you feel about 41 years being held captive? Wouldn't you rather be dead?" he said. Mr. Koren found some solace four years ago when he joined Rolling Thunder Inc., a 90-chapter organization launched in 1995 as an offshoot of the now-famous Rolling Thunder Washington, D.C., motorcycle rally held each Memorial Day weekend. Celebrating its 25th anniversary this year, the rally began with a simple mission that remains unfulfilled: account for Mr. Millner and the thousands of other veterans still missing. The brainchild of Ray Manzo, John Holland and other Vietnam vets, the rally drew fewer than 1,000 bikes its first year. Organizers expect more than 500,000 motorcycles this year, with events kicking off Friday and lasting through Monday's Memorial Day observances. It begins with Friday night's candlelight vigil, includes the signature motorcycle ride on Sunday and concludes on Memorial Day with a wreath-laying ceremony at Arlington National Cemetery's Tomb of the Unknowns, the national Memorial Day Parade and other events. Mr. Manzo is credited with giving the rally its moniker, having told his fellow organizers that it would sound like thunder when the bikes rolled into the nation's capital. A reclusive figure who spent two years in Vietnam, Mr. Manzo stepped away from the Rolling Thunder rally in 1992. "It wasn't something for me to do forever," the Marine veteran told Vietnam magazine in a rare interview earlier this month. Coming out of retirement this year, Mr. Manzo will return to witness an event that's grown beyond its founders' wildest dreams. But beyond the sheer size and cachet that the Rolling Thunder rally now carries, there remains at the heart of the gathering a tight-knit community of veterans, family and friends of former POWs and those still missing. "It's always a very rewarding weekend, not only because of what we do, but because of all the people that we meet," said 76-year-old Billy Parker, former state director of New Jersey's Rolling Thunder Inc. chapters and a Korean War veteran. Mr. Parker, whose Army unit still has several members listed as missing, said he threw himself into Rolling Thunder after his wife passed away several years ago. "The camaraderie between all of the members is fantastic," he said. "You know just about every person by name. That's how familiar you become with all of them." Since its inaugural run in 1987, the Rolling Thunder rally has driven the effort to focus attention on the nation's missing heroes and prisoners of war. Its founders have successfully pushed legislation to keep missing soldiers, sailors, Marines and airmen from being declared dead without concrete evidence. The Rolling Thunder Inc. chapters, in more than 30 states across the nation, regularly hold fundraisers to aid veterans' groups, visit war survivors in nursing homes and hospitals, help maintain memorial sites and do a variety of other charitable work. The POW/MIA issue is most commonly tied to the Vietnam War, but it's also a part of ongoing conflicts. Army Sgt. Bowe Bergdahl has been held in Afghanistan since June 2009 as a prisoner of the Haqqani terrorist network, an insurgent group with ties to the Taliban. With the U.S. still negotiating for his release, Sgt. Bergdahl's imprisonment serves as a stark reminder of the costs of war. "These kids volunteer to go to war, and we're not supposed to abandon them. We left people behind in World War II, in Korea, in Vietnam, and now we've left one behind in Afghanistan," said Vietnam veteran Ted Shpak, president of the Rolling Thunder D.C.'s board of directors. Nearly 1,670 men and women who fought in Vietnam are still listed as missing. An additional 7,957 Korean War veterans remain unaccounted for, as are a staggering 73,681 veterans of World War II. Thanks in large part to the work of Rolling Thunder, the National League of POW/MIA Families and other organizations, federal efforts to identify and recover the remains of missing servicemen have intensified over the past 20 years. Just this year, the Defense Department announced the identification of 25 military personnel, ranging from an airman who went missing during World War II to Staff Sgt. Ahmed K. Altaie, the final missing soldier and casualty of Operation Iraqi Freedom to be recovered and identified. Veterans of the Korean and Vietnam wars were also identified this year. Family members and friends of the missing often assume the worst, but any trace of doubt - or spark of hope - can lead to many sleepless nights, said Ann Mills Griffith, chairman of the board at the League of POW/MIA Families. "It's been the core motivation since our league was formed, the uncertainty," she said. "Uncertainty is always the worst thing to deal with. It's the strongest motivation to get clarity, to get closure. What it really means is, you need to find answers." 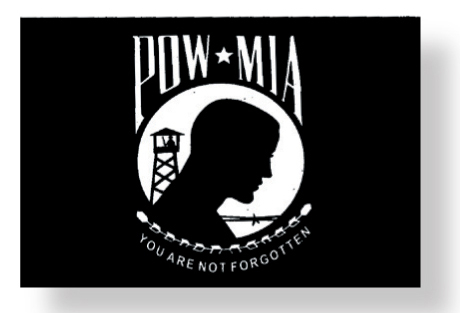 The public outcry to retrieve POWs such as Sgt. Bergdahl, Ms. Mills Griffith said, usually remains strong as long as there is proof they're alive. But the desire to recover veterans of World War II or Korea, most of whom are almost certainly dead, wanes with time, she said. "There's just not that sense of urgency to rescue. Once you find out that the little kid who fell down the well is dead, the nation's attention starts to turn away," she said. While Rolling Thunder's prime focus has been and continues to be the missing or known POWs, its members also relish the chance to interact and learn from veterans who made it home. "It's given me an opportunity to meet a lot of Vietnam veterans. You meet vets who are homeless, some who aren't getting the care and support that they should," said Wendell Wilson Jr., an Army veteran and member of Rolling Thunder Inc.'s Maryland Chapter 1. He and fellow members washed and rinsed the Vietnam Veterans Memorial Wall at 6:30 a.m. on May 13, one of the ways participants seek to honor America's heroes. "You need to care about soldiers to be in Rolling Thunder," Mr. Wilson said, as colleagues scrubbed the wall behind him. "You listen to conversations between husbands and wives, or you meet guys who have gotten 'Dear John' letters. ... When you're in Rolling Thunder, you have the opportunity to give back to them, just a little bit." Maryland Chapter 1 is also one of the few chapters to include junior members, often teenagers. Its leaders are also quick to point out that riding a motorcycle isn't a prerequisite to join. Neither is being a veteran. It's that cross-section of people, brought together by their gratitude and concern for veterans, that gives Rolling Thunder an appeal that now extends beyond the borders of the U.S.
"It brings people from all walks of life together to honor America's heroes. You have lawyers, diplomats, poor people, rich people, and it was Rolling Thunder that has brought them all together," said Euripides L. Evriviades, Cyprus' former ambassador to the U.S., who rode in the annual rallies during his time in Washington from 2003 to 2006. "The moving part for me is that [Rolling Thunder members] don't always necessarily agree with the policies that got them into the wars in the first place, but they distinguish that and still support the troops. I find that very moving," he said. As riders from across the country descend on D.C., the Rolling Thunder rally's charter members aren't basking in the glory of what they've built. Instead, they're focused on using the influence they've built, along with their vast network of veterans, motorcycle lovers and others, for another 25 years. "As Vietnam vets, we've stuck together over the years. It's because we didn't want what happened to us to ever happen again. We're here, and we want people on Capitol Hill to know that we're not going away," said Mr. Shpak.